Mecano supply flat-pack or pre-assembled high tensile trusses in three configurations. Used for standard flat ceilings in most house applications. Used for raked/cathedra ceilings for a contemporary open plan look. Gable End Trusses designed to suit wall stud spacings. All top, bottom chords and webs are pre-punched, notched, and dimpled to ensure that all webs fit perfectly into the top and bottom chord. All Trusses are available with optional overhang on either or both ends, allowing for easy attachment of fascia and soffit sheeting. 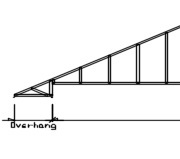 – W41 non cyclonic areas require trusses to be at a maximum 1200mm centres. 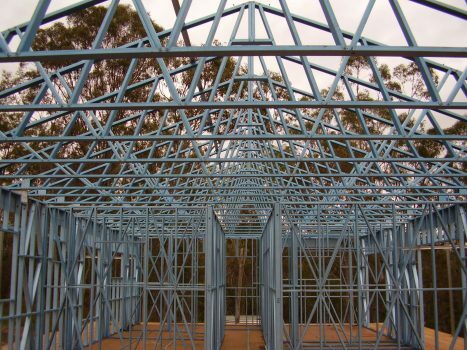 – W50 cyclonic areas require trusses to be at maximum 900 centres.